Can I Afford to Move Into an Senior Living Community? Moving into a senior living community can positively impact many areas of your life. It provides you with the opportunity to make new connections and establish friendships with other residents. Developing and maintaining meaningful friendships as you age can boost your over-all health and wellbeing. In addition, knowing you are in a place where help is nearby should you ever need it provides peace of mind. Leave the health risks that come with excessive worry and stress behind and choose to live in a community that is staffed around the clock. Sounds good, right? But can you can actually afford it? The answers to the three questions below will help you determine whether or not a senior living community is an affordable option. Is it less expensive to remain in my home? Staying in your home for as long as possible may seem like the least expensive way to spend your retirement. But, for a true price comparison it is essential to consider all the costs associated with home ownership. If you own your home, elements such as property taxes and insurance can increase over time. The biggest costs related to staying in your home are the unexpected expenses. Major repairs can come up unexpectedly and drain your financial resources. If your mobility changes you may need to remodel your home to make it accessible. Considering these factors, remaining in your home could end up being much more costly than moving into a senior living community. What is included in the cost of a senior living community? 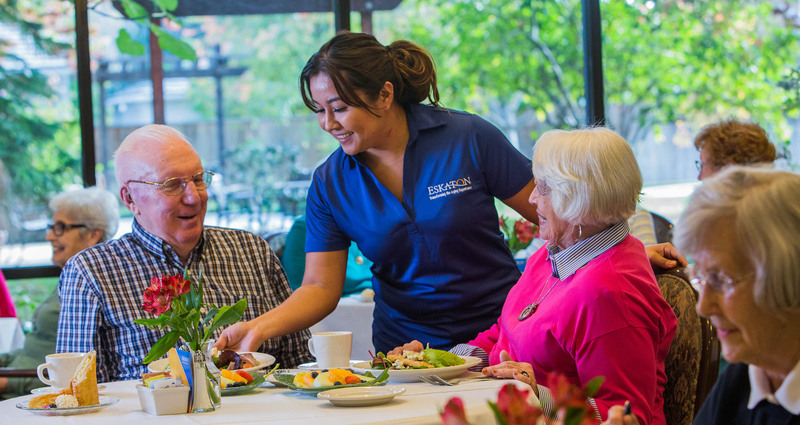 Most senior living communities have a list of features and amenities, but there are certain comforts you will find only at top-rated communities. Make sure to consider this list of costs when making your decision. Where can I find resources to compare the costs? In order to understand the affordability of a senior living community it is essential to compare actual costs. One way to do this is by taking a look at what you currently spend on living expenses and lifestyle. Once you have all of your numbers, compare them with what is included in the community you are considering. Many of the expenses you currently pay are included in the monthly fee at high quality communities. There are likely other services included in the price of the community that you would benefit from if you add them into your life. Eskaton offers an estimate of living expenses and cost comparison sheet that you can use to accurately compare costs. Once you get the details for your desired community, use the comparison sheet to determine the real numbers. Understanding the tangible and intangible benefits of senior living can quickly change your perception. Think of it like an all-inclusive resort. It may be slightly more expensive than a hotel, but it includes a long list of options that would be much more expensive if you paid al a carte. Check out this price comparison sheet and determine for yourself. You may find you can’t afford NOT to choose a senior community for your retirement lifestyle.